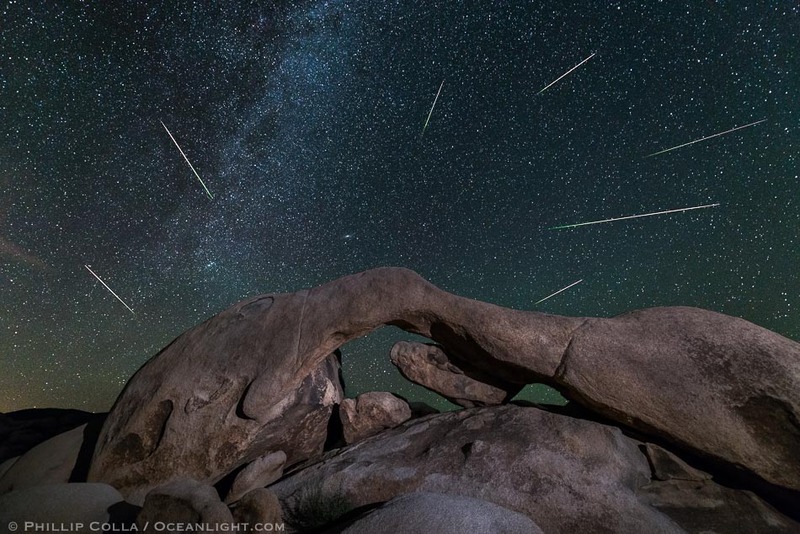 The Perseid meteor shower occurs each August, peaking on the evenings of August 12 and 13. It happens because the Earth is plowing through the trail of dust left behind by comet Swift-Tuttle. The Perseid meteors are named for the constellation Perseus in the northern sky, from which the meteors appear to radiate. When sand- and pea-sized debris left behind by Swift-Tuttle collide with our atmosphere at about 37 miles per second, the gases in our upper atmosphere are superheated and glow, often with colors. That’s what I wanted to photograph, over what has become one of my go-to places to make astrophotographs, Arch Rock in Joshua Tree National Park. I photographed from about 10pm until 3am, seeing hundreds of meteors all over the night sky and capturing about 25 on my camera. What is depicted here is Arch Rock, with the northern arm of the Milky Way visible rising above to the left. The Andromeda galaxy is seen just above and to the left of the top of the arch, like a large star. The constellation Perseus, from which the meteors typically appear to emanate, is behind the arch and just rising above the horizon. What I found interesting is that virtually all of the meteors that I recorded have green coloration at the beginning of their tail, ending in white or light yellow. I don’t recall seeing that when I photographed the Perseid meteor shower over Half Dome in Yosemite a few years ago. OK, whatever. Cheers, and thanks for looking!